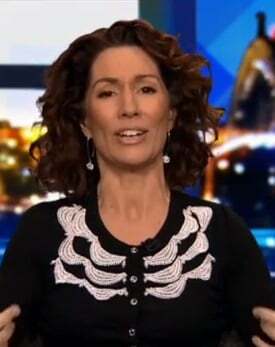 Kitty Flanagan santa joke on The Project ruined Christmas. Carrie Bickmore gets the interview that the whole world wants. UPDATE – because a story about Santa definitely needs an update. 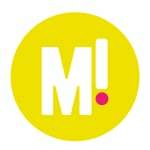 Our friends at The Project have had a big win. Last night the mum-of-one crossed directly to the North Pole to ask Santa Claus the important questions about Christmas. Carrie’s big assignment was the “make good” from the night before, when comic Kitty Flanagan had *cough* joked about Santa’s very existence. 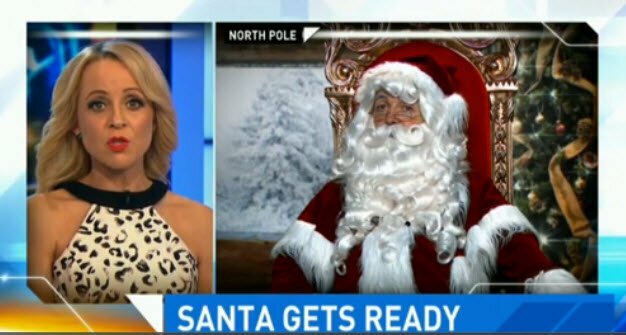 Santa said that he had a couple of new additions to the “naughty list” following Kitty’s interview on Tuesday where she stated that Santa wasn’t real. “Your friend Kitty, she was telling a few fibs last night on the air I think. She was doing so well. She was on the naughty list for most of her life but she had almost made it onto the good list but she blew it,” Santa told The Project hosts. 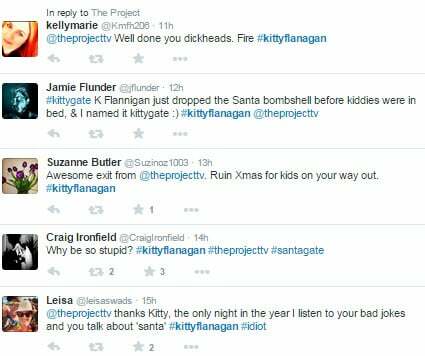 Kitty Flanagan is officially on the Naughty list. Last night, the comedian had her final regular spot on The Project. Usually, Kitty’s reports are met with laughter and social media love. But last night, she used her final moments to reveal the ‘truth’ about Santa. Just in case there are any young children reading (and shouldn’t you be at school? 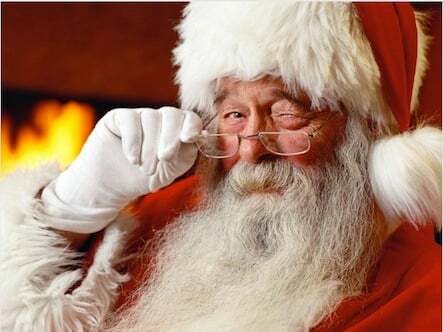 ): The ‘truth’ about Santa is that he is… vegetarian. So, Kitty jokingly revealed the Santa truth. She also stated that Jesus is not real vegetarian. Sounds like Kitty got a bit carried away unexepectedly. 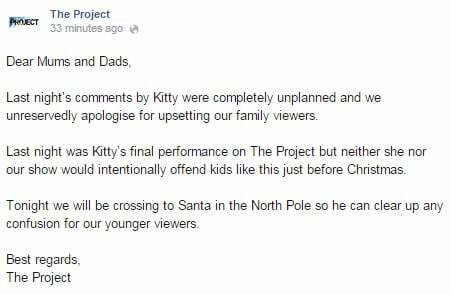 Parents have been pouring out their anger on The Project’s Facebook page, telling stories of how their children were in the room when Kitty made the joke, and are now ‘heartbroken’. Kitty’s comment about Jesus Christ was also not taken well, with plenty of people also venting their rage about that insensitive comment. What a way to say goodbye. We hope Santa forgives her. He sees you when he’s sleeping, he knows when you’re awake. Let’s just hope he doesn’t watch The Project.